Speakers, despite all the joy they bring in the form of music, are often dull looking devices. Often packaged in big square boxes, they stick to basic shapes, and what has worked over the years. Being safe, and sticking to the physics of sound has probably governed this over the year. Edifier, though, have other ideas. Why does a speaker need to look dull? Why shouldn’t it be something that excites you by the very way it looks? Why shouldn’t it be something you proudly show off in your space, rather than tuck it away in a corner? The Edifier Prisma Encore does all this and more. 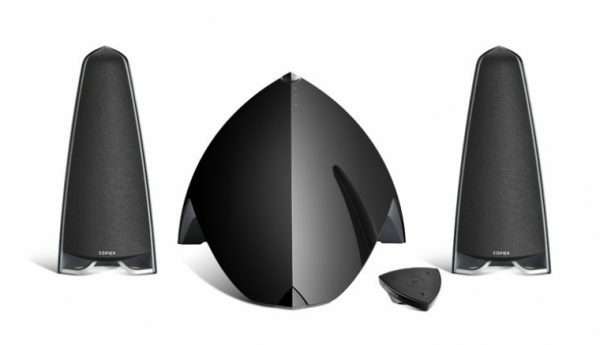 A 2.1 speaker set, featuring a woofer that looks somewhere between a helmet and a pyramid, and two pyramid-isque satellite speakers, it looks the part. On top of that, a remote control that looks like something out of Star Trek (in a good way) adds to the mix. Throw in Bluetooth connectivity, and touch sensitive controls, and you have a complete product. A lot of effort has gone into making this device look and feel good. It even has that ‘new device’ smell. The main unit is probably the best looking of the lot. With a UV gloss, it features a triangular LED strip light on top, which glows green for AUX connection, or blue for Bluetooth, and blinks to indicate accepting any command. In the middle of that triangular strip is the power button. Just in front are the touch sensitive controls, to switch to Bluetooth and push your volume up or down. Further controls can be achieved by manipulating these. A woofer unit sits at the bottom of this, and this is what provides you with a great bass experience. The back includes the ports, for DC power in, AUX connection, as well as output connections to the two satellite speakers. 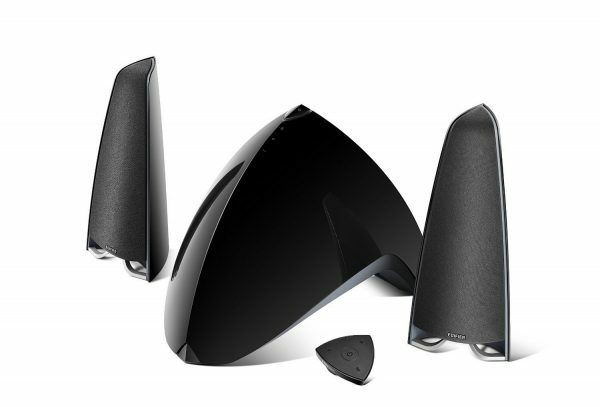 Both the the satellite speakers are also beautifully shaped, though not as elaborate as the main unit. The remote control is definitely my favourite part. It looks like a triangular badge, and is designed to just sit on your index finger while you press it with your thumb. The buttons on it are a soft and rubberised, and feel good. Being small though, I am a bit scared that one may lose it. Just in case though, the buttons on the main speaker work in the same way as those on the remote. Bluetooth pairing is as basic as it gets. Just shift to Bluetooth mode and look for it on your device. OnBluetooth, you also get options to Play/Pause, and go between tracks. If not on Bluetooth, this works very well on Auxiliary input as well. Just plug your device of choice in, and off you go! If I had to put one word to the sound quality, it would be ‘balanced’. How do you get a woofer to give you the feel of the beat without sounding too bassy? I don’t know. But Edifier have gone and achieved it. Often sound systems with 2.1 configuration can be bass or treble heavy, but this one isn’t, and keeps everything balanced. On top of that, you still feel the beats, through your ears, and through your ears. Perfect for those parties to get everyone thumping! Looks, feels, sound, and the ability to be the star of the party. Well done Edifier! Previous story CLICK-BAIT HEADLINES, SCANDALS AND OVER THE TOP WHINGING: Are We Fed Up Of It All?